Katie liked one of our previous boarding pass save the date designs so much, all that needed to be done was customize the colors to match a family tartan. 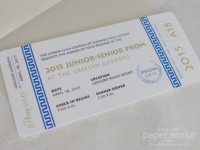 Custom Paper Works’ plane ticket cards are printed on heavy-weight card stock, and this particular envelope color is very thick (for an envelope). While it looks like a simple design, the quality of the materials really makes it stand out. 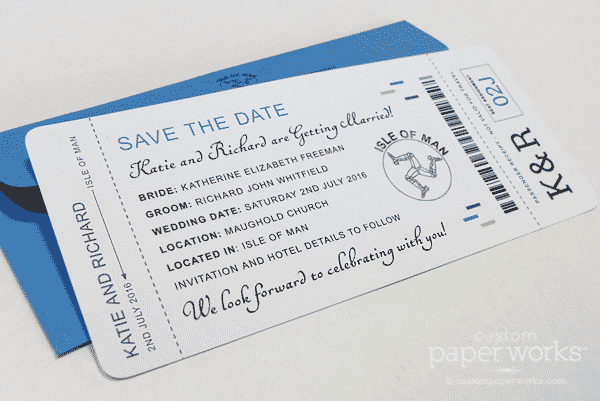 The destination will be Isle of Man for this London couple!